Now that things have finally settled down (in case you missed it I’d been helping my gran prepare her house for sale), it’s time to get back into some decorating for my own home! Starting with my little boy’s half-finished bedroom. You see, from the start I had envisioned using a cool wall lamp though I just couldn’t seem to make things work. Plug-in sconces are virtually non-existent here in Australia so I was always going to DIY something (similar to what I did in my daughter’s room). I only had three requirements – it needed to be easy, it had to have a certain look, and it absolutely, definitely, positively could not negatively impact on my non-negotiable-landscape-art-gallery! Suffice to say, after lots of shopping around and sideways thinking – and even a few attempts! – I didn’t feel confident I could satisfy my criteria (clearly number one was already out the window!). Of course, I could have compromised, or bolstered my efforts, or dedicated more time, though things just suddenly felt all too hard. Besides, my indecision was holding up the most exciting aspect of the space…the landscape art gallery! I decided to forgo the wall lamp all together and things suddenly progressed! 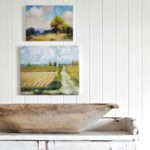 I have wanted a landscape art gallery somewhere in my home FOREVER and am so excited there’s finally one! I absolutely love it! Most of the works are thrifted with nothing costing more than $10. 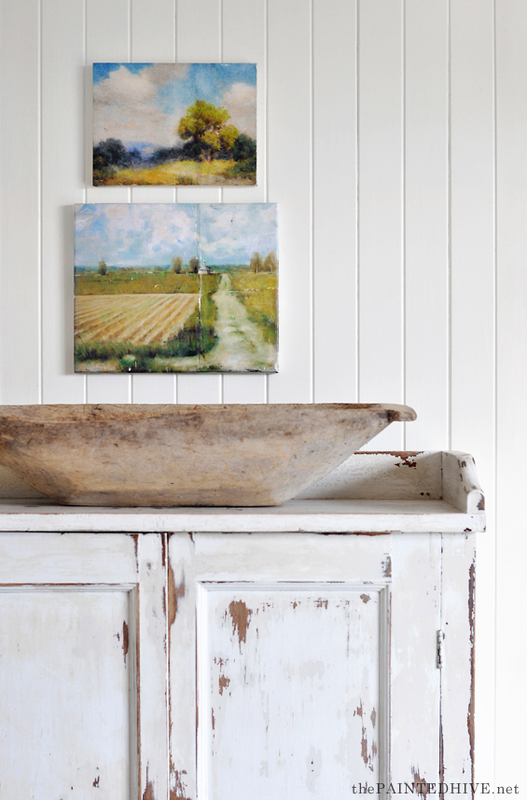 The two smaller canvases are easy DIY’s which I shared here. I didn’t do any fancy gallery wall planning prior to hanging. I simply laid them on the floor and played around until I was happy with the configuration (I like to start with the largest artworks first then build from there) then transferred them to the wall. To keep everything straight and level I secure each frame with a small dob of adhesive putty (Blu-Tack) under one corner. 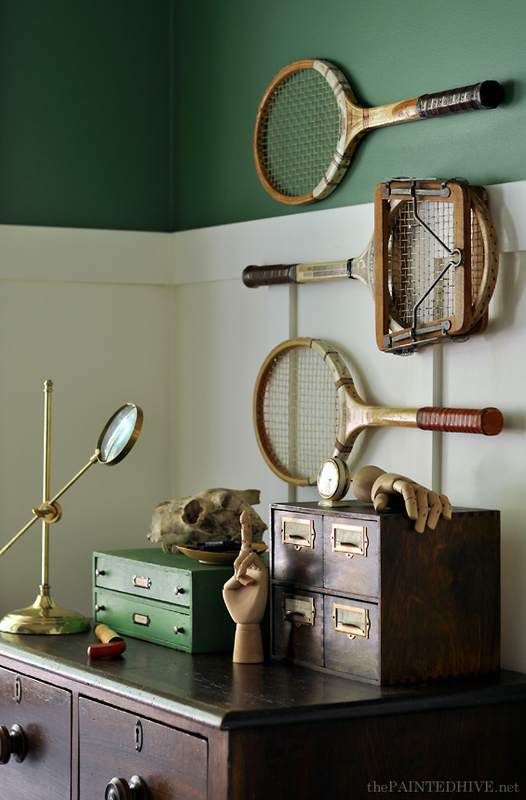 The old tennis racquets are also thrifted. They cost around $35 total. Riley plays tennis so they’re just perfect. Style-wise, the bedding is a bit of a mix of contemporary and vintage, fresh and moody. The plaid throw is the HERMINE from IKEA. They no longer seem to carry it here in Australia. I actually bought mine from Gumtree for $35. The army blanket was a $50 eBay find. The quilt cover was a bit of a splurge (for me!). I wanted something white to freshen everything up (and because it’s a dark room) and just fell in love with this diamond tufted one. It’s the Kokomo from Bambury and was $100 (although the bed is a single I use a double quilt – I just find that up-sizing provides better coverage). I know I could have found something similar enough for half the price though I had been looking for a while and sometimes you’ve just gotta bite the bullet. The mustard velvet lumbar cushion, which I kinda want to marry, is from H&M ($12). It links perfectly with all the warm woods and the autumn tones in the art. 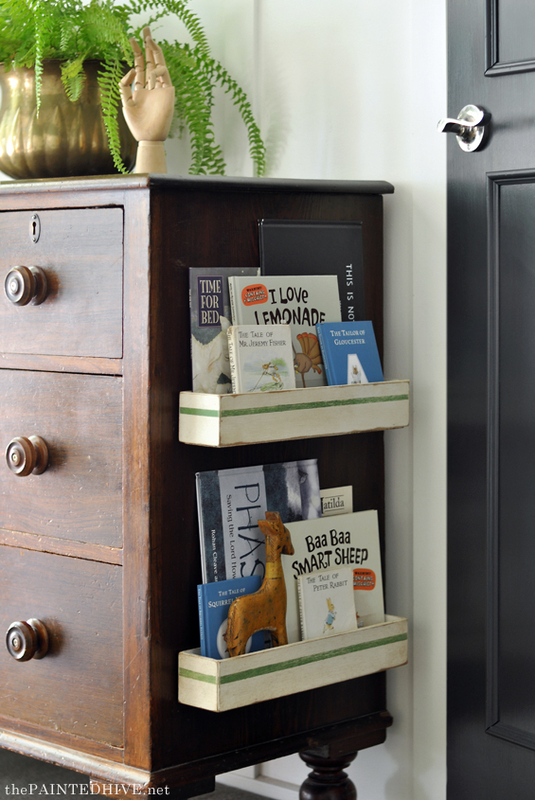 The two mini drawer cabinets are previous DIY projects (you can find my tutorial for the green file drawers here and the card catalogue here). 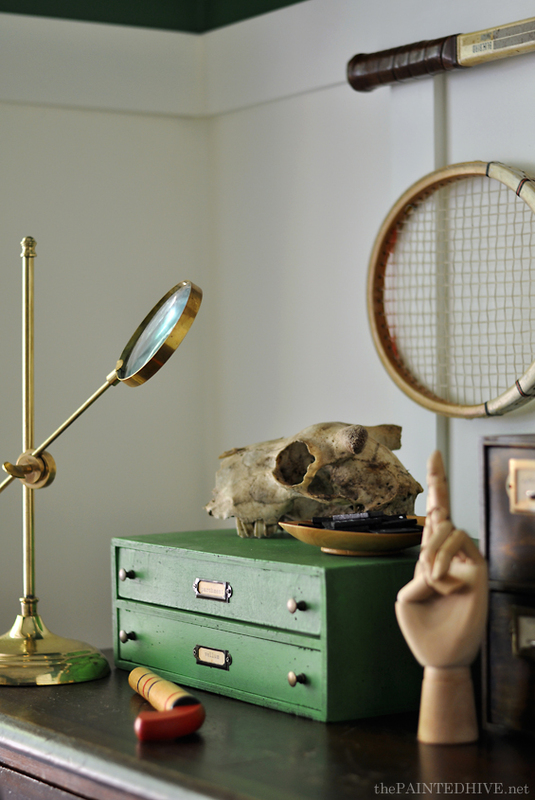 You can buy the timber hands on eBay and the brass magnifying stand is from TK Maxx. The sweet little clock, timber dish and pop gun are thrifted. The skull was found in the paddock behind our house. 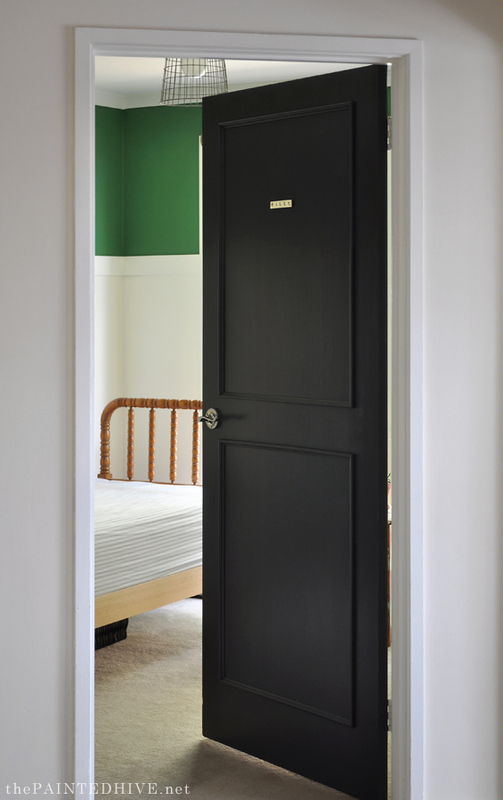 I know it’s hard to gather the configuration of the room from these pics (remember, this isn’t the full reveal post!). Just to give you an idea, the chest of drawers is on the opposite wall to the bed. It’s a tiny room at around 2.7 meters/8.5 feet square. I still need curtains, an end-of-bed toy box and, strangely enough, a lamp (he, he). Some coat hooks, a whimsical accessory or two and probably to paint the desk. I know some of you won’t like hearing that though all of the furniture is wood. Overall, things are just a tad too brown, and it’s a dark room. I’m thinking either an off-white or warm grey? In other news, I have an exciting announcement! 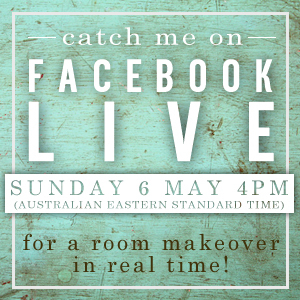 This Sunday at 4PM (Australia Eastern Standard Time – please check the world clock for your local comparable time) I’ll be hosting a Facebook LIVE session centering around the easy transformation of an outdoor space! Click the image below to join my Facebook page if you’re not already a follower. I hope you liked this little progress update. Another beautiful and creative room. 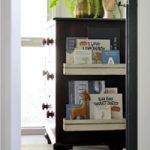 I’ve been reading your blog since your very first master bedroom makeover, and get so much inspiration from you. Thanks for continuing to blog and sharing your ideas with us. I love the collected look of this room! I enjoy seeing all the cool things you have added :) So much fun, and I love the green color. Thanks Julie. That green seems to be a favourite! I’ve had a small obsession with your recreated artwork since you first posted it. So much fun! And the room looks great. Thank you Donna. Have you made any of the artworks? They’re so easy. Yes, I have made several. One turned out so well that I put it in a frame and no one knows it’s not a real painting. Lately I’ve been saving images of sailing ship paintings that I’m going to print. I found a heavier weight tissue paper that I’ve been able to send through the printer without attaching it to another piece of paper. The hardest part is getting the tissue on the canvas without lots of waves and bubbles, but I’m continuing to work on “technique” and thank you for the inspiration. It’s absolutely gorgeous! I love every detail especially that landscape gallery. The room looks great so far Kristine!! Can hardly wait till we can see it all! Love the colors and all the eclectic ideas you have here. Perfect for a boy’s room!! I’m loving this room. 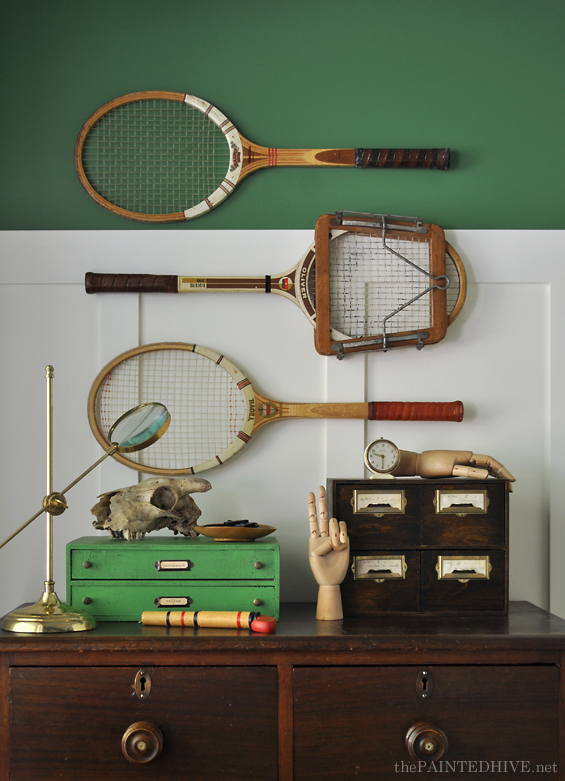 The vintage racquets are awesome and what a deal. 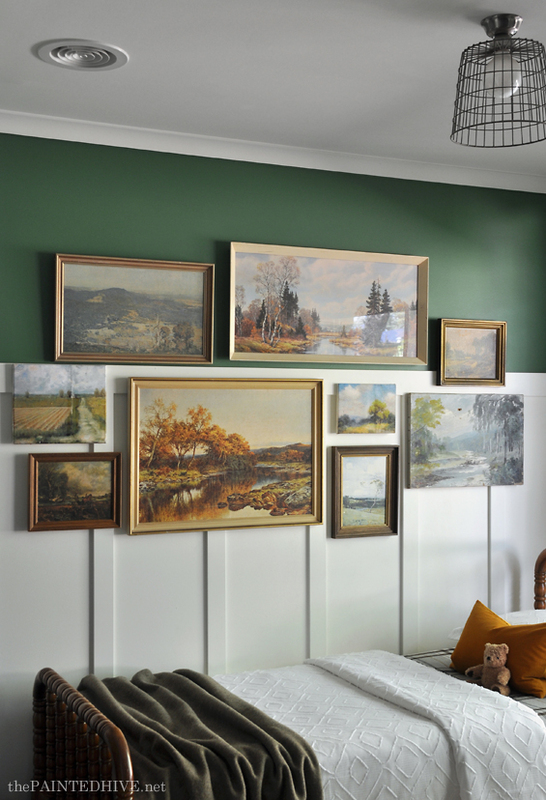 Love the way you did the gallery wall. So many amazing pieces including the magnifier. This little man has an amazing room he can grow with. Good luck with your FB live. It really looks good. Perfect blend of new and old, light and dark – ya know, the Kristine vibe. ;) I am quite bummed that I will miss the FB Live this Sunday. It will happen at 2:00am my time and although I would love, love, love to attend, I am well aware my brain will not function properly at that time (getting older takes those types of things away….). Can’t wait to hear how wonderful it went! I love it so much. The green color is really cool. Your photos are always stunning. Can I ask what camera you use? You are an amazing photographer! Aw, thank you. To be honest, I don’t have an amazing camera. It’s a Nikon D5000 and is about ten years old! I’d love a new one sometime soon. I usually just shoot with the standard kit lens (18mm – 55mm) though my 50mm f1.8 is my favourite. The decor is fabulous as always but I wonder how your boy agrees with the retro look, I mean, mine was all about Spiderman and such. Oh yeah, Spiderman is Riley’s favorite! 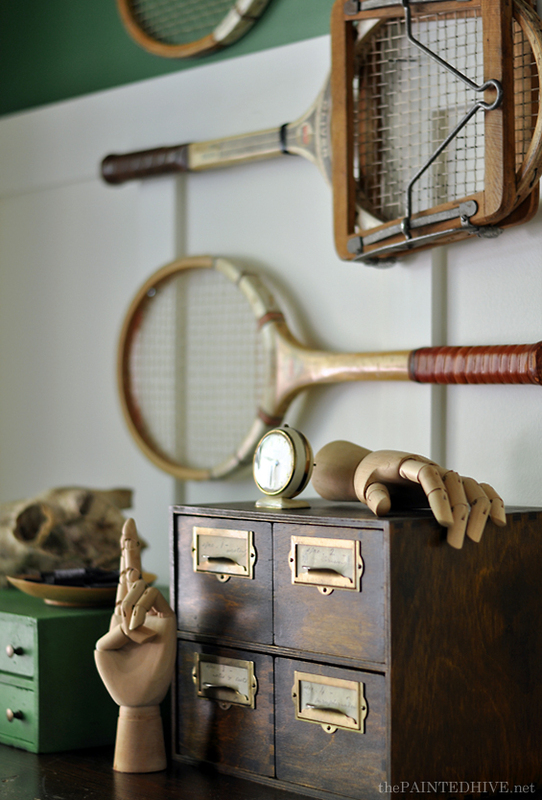 He has a drawer filled with figurines and costumes…that’s enough for me (and him). If I’m honest, this space was definitely a bit self-indulgent. However, Riley loves that he finally has a nicely decorated room with “Hulk walls” and I have really enjoyed bringing it together. This is a great room! 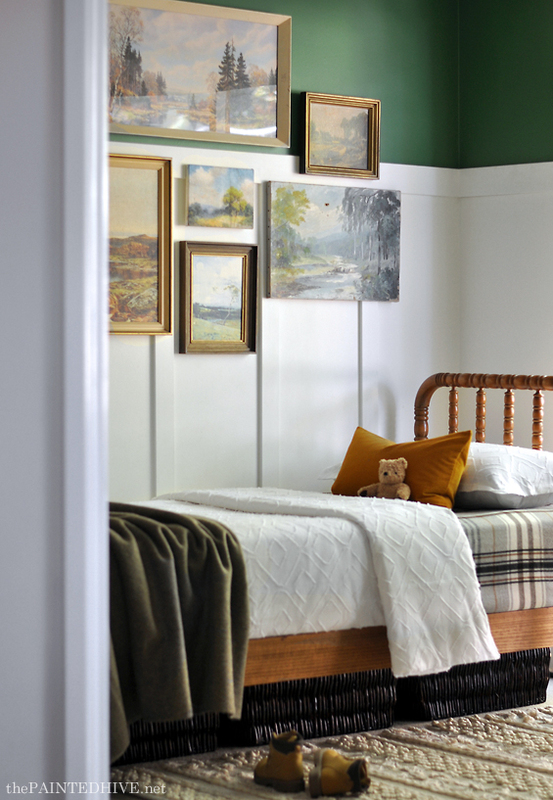 The white paneling keeps the green from overpowering the room. 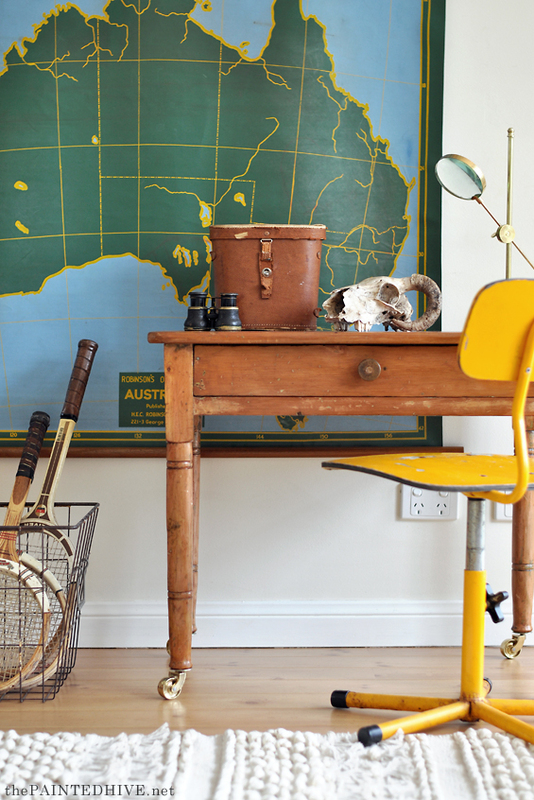 Love the vintage collectibles & the mix of different wood tones. And I love the little desk just as it is, Please don’t paint it. Hmmm, I think the video will only be embedded on Facebook so you will need an account to watch it (or maybe you could borrow someone else’s!). So humbled to have helped inspire you to DIY. It can be challenging, and it often doesn’t go to plan, though I guess that’s how we challenge ourselves. 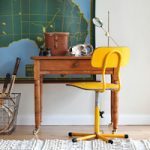 A unique, sophisticated look for a child’s room. Wow, you did a lovely job! 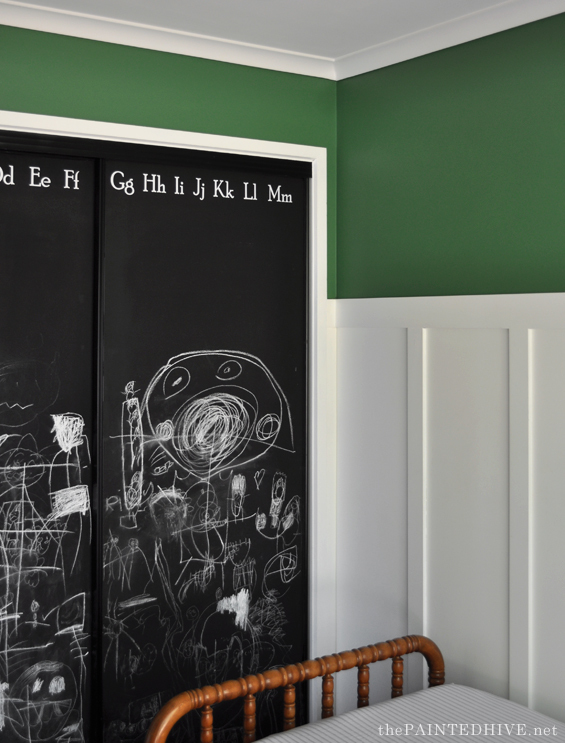 I love when children’s rooms are something fresh and different than what you would expect. 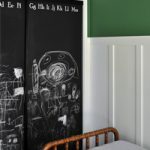 Love that this is a room that a little boy can “grow into”, as well. This is by far the most unique boy’s room I’ve ever seen! 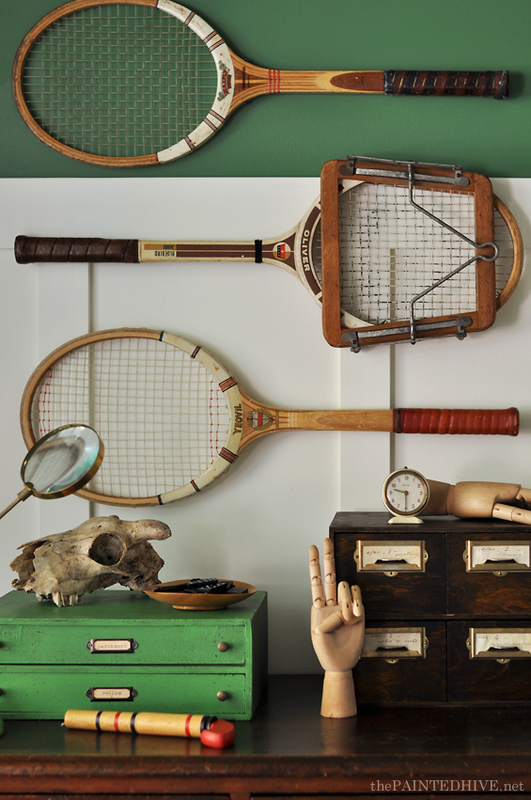 I love your use of the binoculars, the racquets and the old clock. 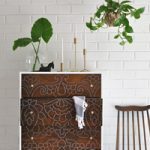 I see many similar elements I’ve used to decorate my own home!